First and foremost, Infinite Air with Mark McMorris is a sports simulation title. There are no stats that can be increased with new boards, there isn’t a special meter that charges and allows you to perform ridiculous tricks, nor are there any maps on active volcanoes, busy city streets, nor frozen lakes. Infinite Air is just you and the mountain. Your stats are constant with the only change being your skill level. All moves are available from the get go as long as you can learn how to land them.Your obstacles are trees, rocks, and various trick ramps or rails. Infinite Air is simply a pro snowboarding simulator, and a decent one at that. Immediately after launching the game, you are thrown into the tutorial to learn how to carve down the mountain properly. A gamepad is required to play, with joysticks and triggers being the 4 main inputs. Left stick turns, stops, reverts (switch stances), and speed checks/stops. Right stick flicks up or down will ollie and nollie, respectively. Triggers handle “charging up” jumps. Remember that this is a simulator? Yea, well you’ll be required to pre-load spins, flips, or big jumps before you launch yourself off a ramp. Rotations don’t happen by sheer will, which means they have to be charged manually and then released at the right time before they degrade. Right trigger handles clockwise rotations, with the left trigger handling counter-clockwise rotations. Pressed together they charge a general jump to launch yourself higher. Throw in the right stick in a specific direction and you can charge front flips, back flips, and barrel rolls. Once airborne, combinations of triggers and the right stick perform a multitude of tricks that you can switch between, as long as you have time. Sliding down the mountain is simple enough, but doing so while performing jumps and rail slides cleanly takes quite a bit of practice. As this is a simulator, you shouldn’t expect speed boosts by pressing A or anything like that. Instead, momentum is gained and lost depending on your actions. Trying to slide uphill? It ain’t gonna happen. Wanna go fast, but keep bumping into trees and landing sloppily? It ain’t gonna happen. Obstacles should be avoided at all cost, ramps need to be hit head on for maximum efficacy, and spins need to be loaded before you take off. Knowing these facts is important, but executing them properly takes time. After landing, your jump is graded Clean, OK, Sloppy, Buttcheck, or Bailed dependant on your position and angle. The better the landing, the more points you’ll add to your score and the easier it will be to continue the run. All this is learned through the tutorial, then reinforced through the Circuit Mode, where you’re tasked with multiple objectives to complete in specific courses. As you learn how to snowboard, you will advance to higher tiers, each which provide their own specific challenges. As you beat courses and challenges, you unlock new gear and snowboards for your character, as well as new snowboarders to choose from. There is a total of 7 snowboarders, 5 of which are unlocked in this mode, and one being your custom character. Customization options are purely aesthetic, allowing you to change everything from the helmet or beanie on your head down to the board and boot bindings. Once you’ve chosen your desired character, you’re off to the mountain. 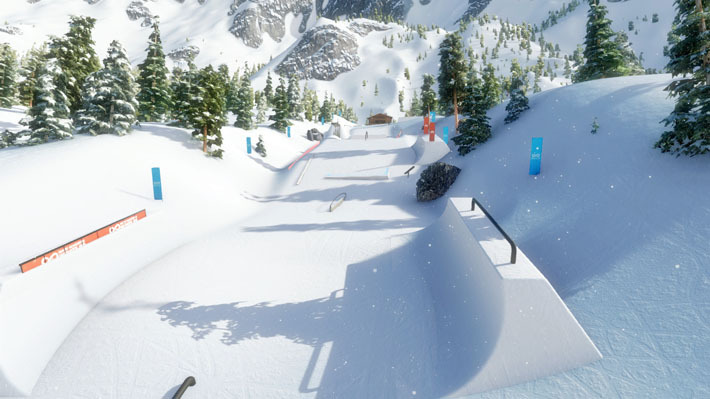 Infinite Air boasts an infinite number of slopes to choose from, with some mountains being procedurally generated. Many of the available courses are created by the community, as there is a track editor present for those interested in creating their perfect slope, or even mountain. The editor is very easy to learn and use, with a number of ramps and other accessories to choose from to populate your track. It doesn’t allow true terraforming, but you can add snow or smooth it out with one tool. Once you’ve tweaked everything to your liking, which you can easily test on the fly, you are allowed to publish it online for all to experience. Finding published tracks is pretty straightforward, as they’re sorted by Backcountry, Slopestyle, Race, Halfpipe, Big Air, and Mountains. There’s a Daily Challenge that changes regularly, as well as a top list, simply labeled Hot. You can also choose and keep specific tracks in the Favorites section. Other elements of Infinite Air are not quite as comprehensive. The graphics are certainly lacking, but not in any way bad. The animations seem accurate and add nice details such as the snow being left with an impression of where your board has been. Character models are not particularly well detailed by today’s standards, as they’re covered in warm, baggy clothing with little variation aside from coloring. Apparently, male snowboarders only wear their hoodies with the hood up, but that’s not really a big deal. The tracklist is comprised of a variety of indie bands, covering the range from alternative rock to electronic 80’s inspired pop to instrumentals. There aren’t too many songs, so you will hear the same ones repeated during your play time, but I felt the list to be varied and catchy enough that I wasn’t tired of hearing specific tracks over and over. Overall I found Infinite Air to be enjoyable, but only to a certain extent. Learning the controls and eventually executing epic grabs that put Billy Morgan’s 1800 quad cork to shame was fun, but certainly took quite a bit of time and concentration. After a while, I felt the desire to play something a little more arcadey and forgiving, like an old SSX or Tony Hawk title. To be fair, I’m not an avid snowboarder, but if I were, and had that unscratchable itch to snowboard in the summer, I could certainly see the value in this title. At the end of the day, Infinite Air with Mark McMorris is a sports simulation title. Everything it does is for those who are looking for a much more realistic approach to snowboarding, and it seems to do so fairly accurately. Specific controls made to recreate an actual snowboarder’s required movements help make this title feel accurate and true to the sport. Because this has been achieved in-game, everything else added is simply icing on the cake. 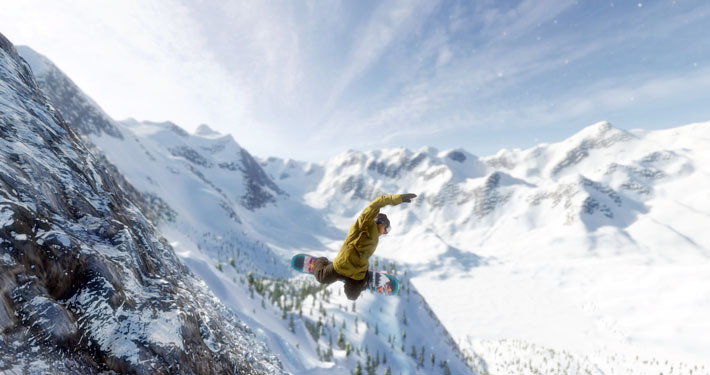 For all of these reasons, the only people who should be planning on buying Infinite Air are those who are snowboarders, those who want to snowboard, and/or those interested in a life-like representation of snowboarding in a game. You know who you are, and here is the title you’ve been waiting for.